Duke University Press, 9781478001164, 288pp. In Infrahumanisms Megan H. Glick considers how conversations surrounding nonhuman life have impacted a broad range of attitudes toward forms of human difference such as race, sexuality, and health. She examines the history of human and nonhuman subjectivity as told through twentieth-century scientific and cultural discourses that include pediatrics, primatology, eugenics, exobiology, and obesity research. 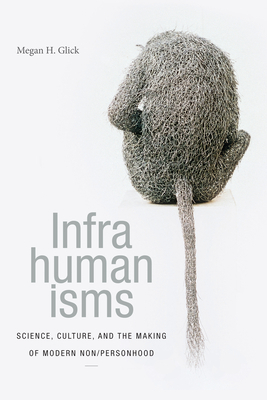 Outlining how the category of the human is continuously redefined in relation to the infrahuman--a liminal position of speciation existing between the human and the nonhuman--Glick reads a number of phenomena, from early twentieth-century efforts to define children and higher order primates as liminally human and the postwar cultural fascination with extraterrestrial life to anxieties over AIDS, SARS, and other cross-species diseases. In these cases the efforts to define a universal humanity create the means with which to reinforce notions of human difference and maintain human-nonhuman hierarchies. In foregrounding how evolving definitions of the human reflect shifting attitudes about social inequality, Glick shows how the consideration of nonhuman subjectivities demands a rethinking of long-held truths about biological meaning and difference.